One of the most appealing aspects of a fireplace in Chantilly is its ability to provide both function and form; in addition to being a warm gathering place throughout the colder months of the year, a fireplace offers an opportunity for aesthetic improvement. Watch this video to learn how to decorate your fireplace mantel. Your fireplace design is one of many visual components of your household over which you have complete control. Your fireplace mantel, hearth, and even doors constitute a focal point that can bear your creativity. One excellent type of fireplace design involves the use of candles. Placing candles on your fireplace mantel provides an extra aesthetic while sticking with the theme of fire; however, electric candles can be safer yet equally as visually appealing in comparison to normal candles. Consider choosing similar candles with different types of holders or different types of candles altogether. The mantel is usually the most prominent design aspect on a fireplace. In addition to being a focal point of the room, mantels serve as a display shelf that can hold ornaments, artwork, and other décor. If you are seeking a professional fireplace renovation or fireplace installation near Chantilly , Home Living Fireplaces has more than 45 years of experience to offer. To take a closer look at some fireplace mantel styles, read this article. There are many natural materials that can be used to make a fireplace mantel . The most common materials used are stone, marble, and wood. Available in a broad range of colors, stone mantels such as limestone, granite, river rock, and concrete look great with a large fireplace. Marble mantels are elegant, hard, and long-lasting. They are ideal for a formally decorated room and fireplace. Wood mantels can be simple and rustic, carved and ornate, or somewhere in between. They come in hardwoods like oak, cherry, and cedar. 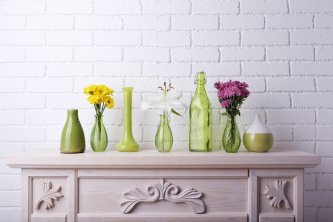 Because wood mantels can be painted or stained, there are myriad colors and textures you can create. Colonial mantels are charming and guaranteed to add visual warmth to any room. They look best with traditional furnishing and décor. Victorian mantels are more elegant and formal than colonial mantels. They are usually made of dark wood and feature ornate carvings and details. French mantels are known for being very decorative and opulent, which makes them look especially attractive in a formal setting. Rustic fireplace mantels are typically made from salvaged wood, old doors, wooden beams, and logs. To let the natural beauty of a rustic fireplace mantel stand out as much as possible, leave it uncluttered. For a sophisticated, unique look, opt for a historic fireplace mantel. Just be sure it fits your fireplace or that it is trimmed to the proper fit—antique mantels are oftentimes too large for a modern fireplace.